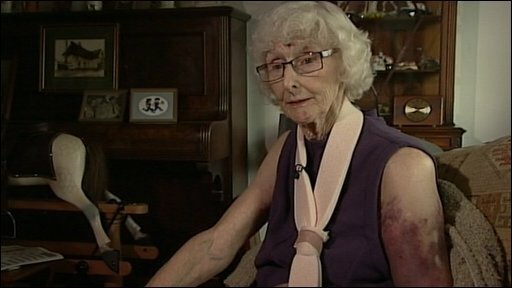 A children's author was left with a broken arm after trying to resist a robber in a Cambridgeshire village. Jean Adamson, 81, from Stretham, near Ely, wrote the much-loved Topsy and Tim books with her late husband Gareth. She was walking from the village Post Office along the High Street on Sunday morning when a youth grabbed a shopping bag from her shoulder, police said. Mrs Adamson tried to hang on and was pulled along the ground for a short distance but eventually let go. The robber made off in the direction of Pump Lane. Mrs Adamson was taken to hospital but has since been discharged. Det Sgt Daren Cooper, from Cambridgeshire Police, said: "This was a nasty street robbery and the victim was very brave in her efforts to resist. "She had been to the Post Office prior to the incident and could have been followed by the youth along High Street. "I suspect the offender lives in the local area and I would ask anyone who knows or is related to him to come forward as he should not be protected." The offender is described as white, about 5ft 8in (1.7m) tall and 15 to 17 years old. He was wearing a white T-shirt with a shirt over the top, and a grey baseball cap with a white peak.